The airport operates with three terminals. The third terminal adjacent to the previous two opened on 15 March 2010, and flight operations started on 16 March 2010. A second runway opened at the airport on 26 June 2012. Málaga Airport is the busiest international airport of Andalucía, accounting for 85 per cent of the region's non-domestic traffic. It offers a wide variety of international destinations. The airport, connected to the Costa del Sol, has a daily link with twenty cities in Spain and over one hundred cities in Europe. Direct flights also operate to Africa, the Middle East and also to North America in the summer season. Airlines with a base at the airport are Air Europa, Norwegian, Scandinavian Airlines, Ryanair and Vueling. Málaga Airport is one of the oldest Spanish airports that has stayed in its original location. Málaga Airport opened on 9 March 1919. After test flights, the first scheduled air service from Málaga began on 1 September 1919 when Didier Daurat began regular flights between Toulouse, Barcelona, Alicante, Tangier and Casablanca. The single runway was extended in the 1960s, and a new terminal was erected in the centre of the site. During this period of development, new navigational equipment was installed, including radar system at the end of the decade, in 1970. The airport was given its current title in 1965. In 1968 a new passenger terminal was opened. In 1972 a second passenger terminal was opened to cater specifically for non-scheduled traffic. An increase in companies offering package holidays (around 30 by 1965) meant that this type of traffic was providing an increasing proportion of the airport's business. The terminal was very similar to the ones that were built in Palma de Mallorca, Alicante, Ibiza and Girona. On 30 November 1991, a new passenger terminal opened at the airport which is today's Terminal 2. It was designed by Ricardo Bofill. Almost all services moved their operations to this terminal when it opened with the exception of checking in. In 1995, the old passenger building was converted into a general aviation terminal, and a new hangar for large aircraft maintenance was built to the north of the airport site. Also constructed was a terminal specifically catering for cargo traffic a year later, along with a hangar for maintenance of big aircraft. In 1997 an enlargement of the parking of gates was built and fuel systems were added at all the gates. In November 2002 a new control tower was built with a height of 54m,. In 2004 the "Málaga Plan" was started, including ideas for construction of a new terminal, and a new runway. In 2005 the old passenger terminal from the late 60s was demolished to make room for the planned expansion of the airport. In November 2005 Monarch Airlines opened a base at Málaga. It based an Airbus A320-200 there and operated scheduled services were added to Aberdeen, Blackpool and Newquay. However, due to their routes being unpopular, the base was closed in 2007. In March 2007, Clickair opened a base at Málaga after announcing a new route to Barcelona. The base has remained since the airline merged with Vueling. On 26 February 2009, Ándalus Líneas Aéreas started operations from Málaga, but then ceased operations in August 2010. This was the only airline that had their main base at Málaga, until Helitt Líneas Aéreas opened their base in late 2011. On 16 December 2009, low-cost carrier Ryanair announced a base at this airport. This would be their 38th base with an additional 19 routes, bringing Ryanair's total routes from Málaga to 39. The base opened on 23 June 2010. An extra route to Barcelona was announced after the planned opening of their Barcelona base. On 15 March 2010, the new Terminal 3 was completed. It was opened by King Juan Carlos of Spain, opening to public use the following day. 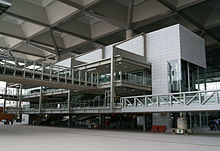 On 10 September 2010, the suburban railway station at Málaga Airport was opened, providing access to catch a train to Málaga from Terminal 3. In November 2011, Helitt Líneas Aéreas opened their base at Málaga, operating flights to Melilla Airport as well as opening additional routes. The company ceased operations in November 2014. On 17 May 2012, the first commercial landings on the second runway took place for the first time. The first aircraft to use it was a PA-28 private 4 seated single engine light aircraft and the first commercial flight was Transavia Flight HV6115 from Amsterdam, operated by a Boeing 737-800. A total of 44 aircraft landed on the new runway. The runway was placed into service after the airport obtained the safety clearance of Civil Aviation on 30 April 2012. The runway officially opened on 26 June 2012 and it was inaugurated by the Spanish Minister of Transport, Ana Pastor. It is located on the other side of the terminals where the current runway is. It is in the direction of 12/30 and it has three rapid exits. In June 2017, Scandinavian Airlines Ireland announced they were to open a base at Málaga. The base opened in June 2018. On 14 March 2018, it was announced that Primera Air were also to open a base at the airport with one based aircraft and six new routes. The base was to open on 27 October 2018, however this did not happen as the company ceased operations on 1 October 2018. Málaga Airport has three adjacent terminals, although only two are in use. It also has a General Aviation Terminal and a Cargo Terminal. Passengers can interchange between Terminal 2 and Terminal 3 both landside and airside. The Airport consists of three piers or docks used by airlines: Pier B (with 13 gates, 7 with airbridges) and Pier C (with 10 gates, 7 with airbridges) in Terminal 2, and Pier D (with 20 gates, 12 with airbridges) in Terminal 3. Pier B is used for non-European traffic (as well as Schengen flights on the lower level), Pier C is used by non-Schengen Traffic and Pier D is used for Schengen Traffic. Flights to the UK and Ireland use both Pier B and Pier C. EasyJet, EasyJet Switzerland & Ryanair flights check in at Terminal 2 whilst all others use Terminal 3. The terminals have a total of 164 check-in desks, and have a total of 48 boarding gates of which 26 have airbridges. Terminal 1 (styled as T1) opened on 30 June 1972 and was used for flights to non-Schengen destinations, along with flights to Ceuta and Mellila. On 16 March 2010, flights to non-Schengen destinations moved to Pier C in Terminal 3 and flights to Ceuta and Mellila moved to Pier D, leaving Terminal 1 operating no flights, although Jet2.com continued to checked in flights there for a short time but moved to Terminal 2 shortly afterwards. The terminal has now been closed to the public. 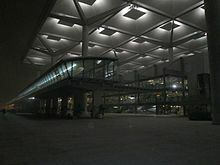 The terminal 1 baggage hall was shown in the episode "The Return of the Seven: Part 1" in series 2 of Auf Wiedersehen, Pet. Terminal 2 (styled as T2) was opened on 30 November 1991, known as the Pablo Ruiz Picasso terminal. The building was designed by architect Ricardo Bofill, and was built to be operated in combination with the pre-existing passenger terminal. It has three floors and a basement, the second floor is for departures and the ground floor is for arrivals. The first floor is used for the lower level for Pier B, and for alleyways leading to arrivals. The basement is for the rental-car pickup desks. To complete the terminal, a building was built for car parking and rental cars, which were built right next to the entrance of the departures and arrivals lounges. Development work was completed on the terminal in 2008. The original structure leading to Pier C in departures was demolished and replaced with a temporary structure to allow building work for Terminal 3 to be completed in its place. The temporary structure was closed and removed once Terminal 3 opened and Pier C is now accessed from Terminal 3. Work in the terminal had to be done before the new terminal opened. Because terminal 1 was due to close, all of the gate numbers had to be changed. The only gate that kept its original gate number was B16. The last flight to use the original gate numbers, was an Aer Lingus flight to London Gatwick. When Terminal 3 opened, the old arrivals waiting area was converted to a passengers transfer between terminals in the arrivals hall where three extra baggage carousels have since been added. Terminal 2 has been refurbished since Terminal 3 has opened costing around €2.5 million. The arrivals floor of Terminal 2 was refurbished in early 2011, and all the ceilings were painted between late 2013 and mid 2014. There is also currently work on the old shopping area, currently closed off. In September 2017 it was announced that Terminal 2 was to undergo a further refurbishment costing €8.4 million. This includes the improvements of the toilet facilities, new flooring and the repainting of the exterior of the building. Pier C closed for refurbishment on 12 November 2018 and reopened in on 18 March 2019 while Pier B is due to be refurbished in Winter 2019. Terminal 3 (styled as T3) is a new terminal at Málaga Airport. Plans for construction started in 2001 and construction started in 2004. The works were carried out by Ferrovial. It was opened on 15 March 2010 by King Juan Carlos. The new terminal building at Málaga Airport has been designed by architect Bruce S. Fairbanks. The terminal was built to increase tourism around the Costa Del Sol, and to expand the airport due to increasing number of passengers. It is adjacent to Terminal 2 and has an area of 250,000m², which is more than double the size of Terminal 2. It has 86 check in counters, numbered 301 to 386, 20 new boarding gates, twelve which will have airbridges and 12 baggage reclaim carousels; nine European Union, two non-European Union and one special baggage reclaim carousel. The terminal has more than doubled capacity to 30 million passengers or 9,000 an hour, is expected to double the number of flights and the 12,813,764 passengers handled during 2008, and this has increased further since the new runway was completed. The general aviation terminal at Málaga Airport (also known as the private aviation terminal) is located next to the N-340 motorway, and close by runway 31. The terminal was formed from the old passenger terminal building, and has since been renewed and refurbished. It was opened on 29 January 1968. The terminal is used for private jets. The cargo terminal was opened in 1996, with 16 docking bays for road transport vehicles. It has an area of 5,700 m2 (61,000 sq ft) and contains four cold-storage rooms, a vault for valuable merchandise, and an area for hazardous and radioactive materials. It is located in the north of the airport, named "Carga Aena" in Spanish. A new car park has been built with seven floors and 2,500 parking spaces, with underground parking for 66 coaches. A long stay car park opened in mid-2010. Passenger numbers at Málaga increased from 6 million in 1995 to 13.6 million passengers in 2007, dropping to 12.8 million in 2008. There was a further 9.3% reduction in 2009 with passenger numbers falling to around 11.6 million and the number of aircraft movements reducing by 13.6% to 103,536. However passenger numbers in 2010 increased to 12 million, and increased again in 2011 to 12.8 million and decreased slightly to 12.5 million in 2012. Passenger numbers increased to 12.9 million in 2013. Cargo operations are decreasing each year. Updated: 13 January 2018. 2017 Data Provisional. The busiest routes are those within the EU, particularly to and from the United Kingdom and Ireland. According to Aena, the busiest route is to London Gatwick followed by Manchester and Barcelona. Other busy routes are to Amsterdam, Dublin, Copenhagen, Brussels, Paris–Charles de Gaulle, London Stansted, Birmingham, Bristol and Cork. Two roads accesses the airport – the MA-21 (Torremolinos–Málaga). The new access road from the MA20 is now open. Málaga Airport now has a transportation hub outside the new terminal 3 that can be accessed from the new terminal building from both the arrivals and departures levels. There is an arrivals floor and a departures floor. The bus station and the suburban train station can be reached from the arrivals level, and both car parks can be reached from the departures level down a long covered walkway. The airport has an underground station for Cercanías Málaga commuter trains, connecting with Málaga, providing enhanced communications with the city center. The station opened on 10 September 2010 and is located at the arrivals area of Terminal 3. Trains run every 20 minutes between Málaga City and Fuengirola via Málaga Airport. The line is to be extended to Marbella, but this will not be complete until 2020 at the earliest. Work is currently halted, while awaiting financial assistance from the European Investment Bank. The line may be extended to Algeciras, but this has yet to be confirmed. There is a bus station located underground at the airport. It can be reached from the arrivals level of the transportation hub or from arrivals in terminal 3, which can be accessed from all terminals. There is also a bus stop outside the cargo terminal. Following a collaborative agreement between the Málaga Metropolitan Transport Consortium, the Málaga Transport Company (EMTSAM) and the Portillo Avanza bus company, a new public information and bus ticket sale point is now in operation at Málaga Airport. Before the new terminal opened the airport had only one large car park, called P2. The airport now has two, with 3,700 spaces (1,200 in P2, 2,500 in the new P1). All outdoor spaces now have covers over them They can also be reached by the transportation hub. 13 September 1964 – A Balair Fokker F-27 (registration HB-AAI) approaching the runway too high. The pilot did a steep descent and the plane landed heavily, causing part of a wing to break off. There were no fatalities. The aircraft was written off. 20 December 1970 – A Sobelair Douglas DC-6B (registration OO-CTL) returned to Málaga due to severe weather at the aircraft's destination. A hydraulic system failure occurred and the left main undercarriage gear failed. This caused the aircraft to veer left once it landed. There were no fatalities. The aircraft was written off. 13 September 1982 – Spantax Flight BX995 a DC-10-30CF (registration EC-DEG) When the aircraft was rolling for take-off, the pilot felt a strong vibration and aborted the take-off. The flightcrew lost control of the aircraft and were unable to stop in the runway length available. The aircraft overran the runway, hit an airfield aerial installation, and lost an engine. It crossed the Málaga–Torremolinos Highway, hitting vehicles before hitting a railway embankment and bursting into flames. An emergency evacuation of the aircraft was carried out but 50 on board died, and a further 110 persons were hospitalized. The cause of the accident was the detachment of fragments from a recapped tread on the right wheel of the nose gear, creating vibration. 13 October 2000 - The hijacked Sabena Flight 689 operated by an Airbus A330-200 en route from Brussels to Abidjan made an emergency landing at Málaga where the perpetrator, a Nigerian national, was overpowered by police. 29 August 2001 – Binter Mediterráneo Flight BIM8261 a CASA CN-235 (registration EC-FBC) was on a flight from Melilla to Málaga. On final approach the aircraft's left engine failed, and the aircraft made an emergency landing. The plane hit the first edge lights and stopped next to the N-340. Investigation into the accident revealed that shortly after the initial engine failure, the First Officer inadvertently shut down both of the aircraft's engines, leading to a total loss of power. Four out of the 44 people on board were killed including the pilot Capt. Fdez. Ruano. The aircraft was written off. There is a front section of an Iberia EC-CGO McDonnell Douglas DC-9 at the southern part of the airport, installed in December 2002. It is not far from the General Aviation Terminal. Outside the main car park, there is a Cessna 421 Golden Eagle, registered EC-FPA preserved on plinths. It was installed in 2011. ^ a b c d e f "Estadsticas - Aeropuertos Espaoles y Navegacin Area - aena-aeropuertos.es". Retrieved 1 June 2015. ^ "How to consult the AIP - ENAIRE - Air Navigation". Retrieved 1 June 2015. ^ "Airports". AENA. 29 October 2012. ^ "Airport to be renamed Malaga-Costa del Sol". SUR in English. 15 June 2011. ^ "Order FOM/1509/2011" (PDF). Boletín Oficial del Estado. 16 September 2016. ^ "The second runway at Malaga airport will be inaugurated on June 26". Malaga Airport News. Retrieved 1 June 2015. ^ "World Airline Directory." Flight International. 26 March-1 April 1997. 56. "Aeropuerto de Málaga. Salidas Nacionales. Oficinas 36-37. Málaga, E-29004, Spain." ^ Nicolas Janberg. 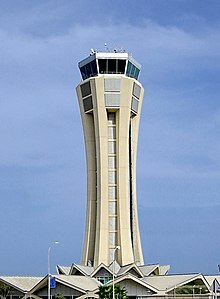 "Malaga Airport Control Tower (Málaga, 2002) | Structurae". En.structurae.de. Retrieved 16 September 2016. ^ "The first commercial planes land on the new runway at Malaga airport". Malaga Airport News. Retrieved 1 June 2015. ^ "Malaga's second runway ready for use this summer". Retrieved 1 June 2015. ^ a b "Malaga Airport New Terminal Building, Costa Del Sol - Airport Technology". Retrieved 1 June 2015. ^ "Ferrovial y Sando se adjudican las obras de ampliación del aeropuerto de Málaga por 17,4 millones". La opinión de Málaga. ^ "Málaga opens Terminal 3 to double capacity". anna.aero Airline News & Analysis. 13 April 2010. ^ a b c "Malaga Airport Cargo Terminal". Retrieved 1 June 2015. ^ "Long stay car park (P3) - Parking offer - Málaga-Costa del Sol Airport - Aena". Retrieved 1 June 2015. ^ a b "Laudamotion outlines summer 2018 operations". routesonline.com. 16 March 2018. ^ "Saudia plans Malaga service resumption in S18". Airlineroute.net. Retrieved 5 February 2017. ^ a b 2017, UBM (UK) Ltd. "SAS adds new European routes in S17". ^ 2017, UBM (UK) Ltd. "TUI Belgium outlines S17 new French / Italian routes". ^ "TUIfly adds Hanover – Malaga service in S17". Routesonline.com. Retrieved 16 September 2016. ^ "Introduction - Málaga-Costa del Sol Airport - Anna.aero". Retrieved 18 July 2017. ^ "La autopista de Las Pedrizas estarα acabada en noviembre - La Opinión de Málaga". Laopiniondemalaga.es. Retrieved 16 September 2016. ^ "Malaga airport information: Departures, Arrivals, Reviews and Blog". Archived from the original on 1 April 2015. Retrieved 1 June 2015. ^ "How To Find And Use The Train At Malaga Airport". Retrieved 1 June 2015. ^ "Magdalena Álvarez: "El BEI puede financiar el tren litoral porque es un proyecto rentable desde todos los puntos de vista". SUR.es". Diariosur.es. Retrieved 16 September 2016. ^ Harro Ranter (13 September 1964). "ASN Aircraft accident Fokker F-27 Friendship 200 HB-AAI Málaga Airport (AGP)". Aviation-safety.net. Retrieved 1 June 2015. ^ Harro Ranter (20 December 1970). "ASN Aircraft accident Douglas DC-6B OO-CTL Málaga Airport (AGP)". Aviation-safety.net. Retrieved 1 June 2015. ^ Harro Ranter (13 September 1982). "ASN Aircraft accident McDonnell Douglas DC-10-30CF EC-DEG Málaga Airport (AGP)". Aviation-safety.net. Retrieved 1 June 2015. ^ "1001 Crash - Plane accidents analysis and photos - Binter Mediterraneo - Malaga, Spain - CASA 235-200". Retrieved 1 June 2015. ^ Harro Ranter (29 August 2001). "ASN Aircraft accident CASA CN-235-200 EC-FBC Málaga Airport (AGP)". Aviation-safety.net. Retrieved 1 June 2015.